The sheer scale of e-commerce catalogs means that some content items fall through the cracks. Gap analysis is a personal detective that finds everything missing from your catalog: incomplete product descriptions, missing attributes, non-performing pages and more. CrewMachine searches your entire catalog to identify these gaps so you can prioritize underperforming content and optimize your catalog efficiently. 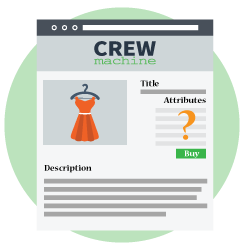 CrewMachine integrates must-have attributes for each type of product and also suggests good-to-have attributes so you never miss a chance to optimize your product descriptions. Our team relies on personal expertise and algorithms built around current markets trends to determine which attributes will help your descriptions stand out in the e-commerce crowd. CrewMachine finds any products missing descriptions so you can fill them in. Beyond that, it identifies poor or shallow descriptions that are unlikely to lead to conversions or need SEO improvement. 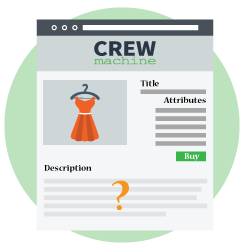 CrewMachine then uses artificial intelligence to create suggested product descriptions, thus speeding up your content cycle. Nothing sinks a product description quicker than a poor image. CrewMachine helps discover which catalog pages are missing images. Its image gap identification technology also finds poor images, including blurry photos and graphics with distracting backgrounds. All you have to do is replace the images to enrich your content.